The day after Texas experienced weirdly warm temperatures and Christmas tornadoes, a blizzard slammed across the western part of the state. A dozen people were killed by the storms, and now, another tragic death toll has been reported: More than 35,000 dairy cows lost their lives. Farmers prepared as best they could — putting down extra bedding behind wind breaks, placing extra bales of hay in front of calf bungalows and in places where snow typically accumulates. 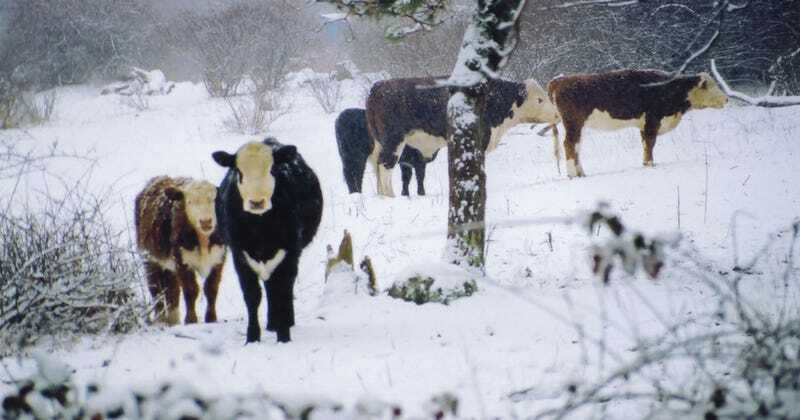 But as the blizzard raged on, cows that had sought shelter behind windbreakers were buried alive by drifting snow. Others froze to death on open fields. Calves that had been nestled inside hutches went hungry because no one could reach them. Farmers who tried to rescue their animals became disoriented and lost on their own land. Early reports estimated the deaths at about 15,000 cows, but as more calves are being discovered in the melting snow, the figures are now closer to 35,000, or about 10 percent of all dairy cows in the region. The biggest problem now becomes how to dispose of the carcasses. The animals have not been raised for their meat so it’s more likely they’d head to a rendering plant to be turned into animal feed or other products. The surviving cows will likely see a dip in milk supply because they were not milked regularly for two or more days. But customers will likely not see an increase in prices for milk or other dairy products, according to the agricultural economist David Anderson from Texas A&M University. Although storms like this are rare, it’s concerning from an animal welfare perspective that so many cows might be killed this way. Dairy cows are left to graze outdoors, even in winter, but can be brought inside barns during severe weather. Unfortunately this storm came on too fast. With stronger storms expected this winter due to El Niño, ranchers need to find a way to keep their animals—and themselves—safe.